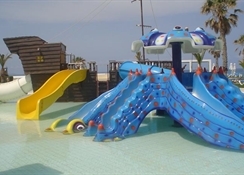 Lyttos Beach Hotel is an all-inclusive family friendly 4-star hotel Located in Anissaras village of Crete, one of the most beautiful islands in Greece. A drive of half an hour separates the hotel from the airport of Heraklion. The hotel, situated on a landscaped 150-acre property, is an oasis of luxury in Lyttos with its six lovely swimming pools, fun waterslides, and 28 tennis courts. The staff at Lyttos Beach Hotel welcomes guests to enjoy a truly comfortable stay with warm, Cretan hospitality. The well-appointed guestrooms furnished with contemporary décor with local accents, have sea facing balconies and come in types of sea or garden view double rooms, family rooms and suites with modern amenities and free Wi-Fi. Lyttos Beach Hotel is situated on the lovely Lyttos beach away from the hustle and bustle of the touristy town at 5km from the resort. The Crete Golf course is 7.6km away. The nearby beach is a delightful, Blue Flag awarded beach with golden sands. The nearest airfield, Heraklion Airport is 21.4km away. Guest rooms at Lyttos Beach Hotel have sea facing balconies and a lovely garden which is full of seasonal blooms and palms. The rooms feature sea or garden view double rooms, family rooms and suites with or without a swimming pool. These come with air conditioning, mini fridge, a 42’’ satellite TV, safe, free Wi-Fi and marble bathroom with hair dryer. Lyttos Beach Hotel serves authentic Cretan, traditional and international delicacies at its Main Buffet Restaurant. There is live action cooking where you can watch expert chefs dish out delicious cuisine from the freshest of ingredients in the most dramatic manner. A special kids’ menu is available. The Zorbas Taverna is the place to go for tasty a la carte dishes in a wonderful seaside setting. There are four bars where guests can relax with refreshing cocktails, house wines, spirits and beers. 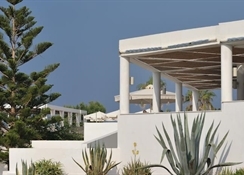 Lyttos Beach Hotel has five swimming pool and kids’ pool and terrace besides having access to the private beach. There is a fully equipped gym for those who wish to stay active. There is a lovely spa with steam room offering massages and therapies. 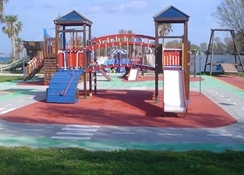 Tiny tots can have fun at Kid’s Club or Playground. The hotel has facilities for Darts, Table tennis, Billiards mini football pitch, a 3 PAR golf course and basketball. The hotel offers water sports activities on the beach. Guests can also shop at the minimarket on-site. There is lively evening entertainment and a nightclub too. Wonderful hotel, super rooms, amazing tennis courts, fantastic pool. Great for the kids, they loved the slides. Food very good qulaity, but very samey night after night. Too much of a good thing!